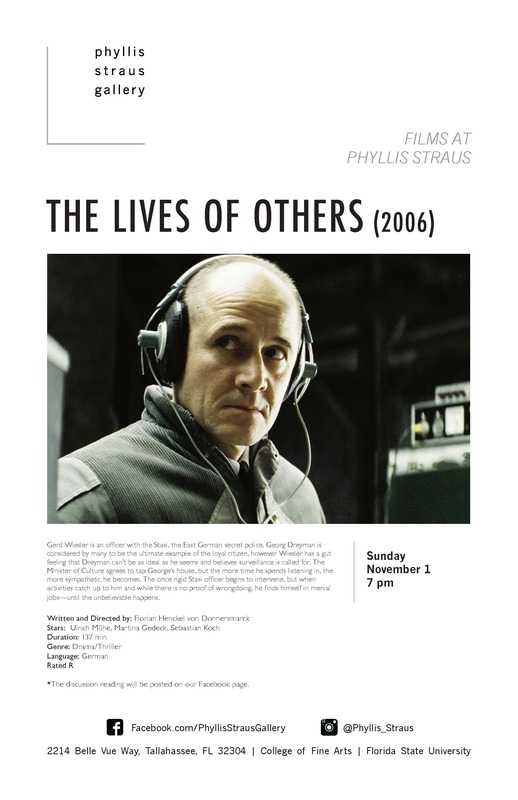 Join us for the screening of the Academy Award winning German film, The Lives of Others (Das Leben der Anderen) at Phyllis Straus this Sunday – November 1st! Gerd Wiesler is an officer with the Stasi, the East German secret police. Georg Dreyman is considered by many to be the ultimate example of the loyal citizen, however Wiesler has a gut feeling that Dreyman can’t be as ideal as he seems and believes surveillance is called for. The Minister of Culture agrees to tap George’s house, but the more time he spends listening in, the more sympathetic he becomes. The once rigid Stasi officer begins to intervene, but when activities catch up to him and while there is no proof of wrongdoing, he finds himself in menial jobs—until the unbelievable happens. The discussion reading will be posted on our Facebook page.